BORONGAN CITY – More than 300 motorbike owners from various parts of the country converged in this city for the BMW Owners Society of Safe riders, 13th Ironman Motorcycle Challenge. Lito Flores, president of the BMW Owner Society of Safe Riders and chairman of BOSS IMC organizing committee, disclosed that the participants were members of motorbike association from Metro Manila, Cotabato, Davao, Nueva Ecija, Cebu and Ormoc. Bikers from the Highway Patrol Group and Philippine National Police also joined to challenge held on November 9. The motorcycle riders travelled 1,200 kilometers for almost 24 hours from Borongan City, traveling to Taft-Buray road for their first stop, then to Naval, Biliran, to Ormoc City, down to Southern Leyte then up to Abuyog, Leyte, stopping at the McArthur Park in Palo, Leyte then travelled back to Eastern Samar via Guiuan before returning to Borongan City. 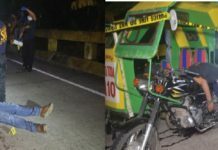 The event, which coincided with the week-long celebration of the 53rd founding anniversary of Eastern Samar, aimed not only to promote road safety but also to promote the tourism potential of the region, especially Eastern Samar among motorbike riders. “We need to promote the country’s various tourism potentials especially this side of the country,” Presidential Assistant for the Visayas Michael Dino said in his message sharing that event of BOSS Ironman responds to the call of the government to “ride south” and promote the tourist destination in the southern part of the Philippines. 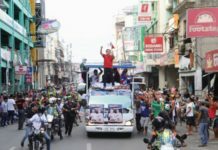 Iloilo and Cebu had asked the organizers of BOSS Ironman to hold the Visayas leg in their area but they chose Eastern Visayas because of its historical significance. Eastern Visayas, particularly Eastern Samar, has a great contribution to the pages of the country’s history. In March 16, 1521, Ferdinand Magellan, a Portuguese navigator who sailed under the Spanish flag, set foot for the first time in the country, in Homonhon Island an island more than 20 kilometers away from the coast of Guiuan, Eastern Samar. In October 17, 1944, the Suluan raid happened, the first step to Liberation Day, when the Allied Forces led by General Douglas McArthur fulfilled his promise of returning to liberation the country from the Japanese Forces.